Book terrific things to do in Costa de la Luz online on sunbonoo and make memories that'll last a lifetime. 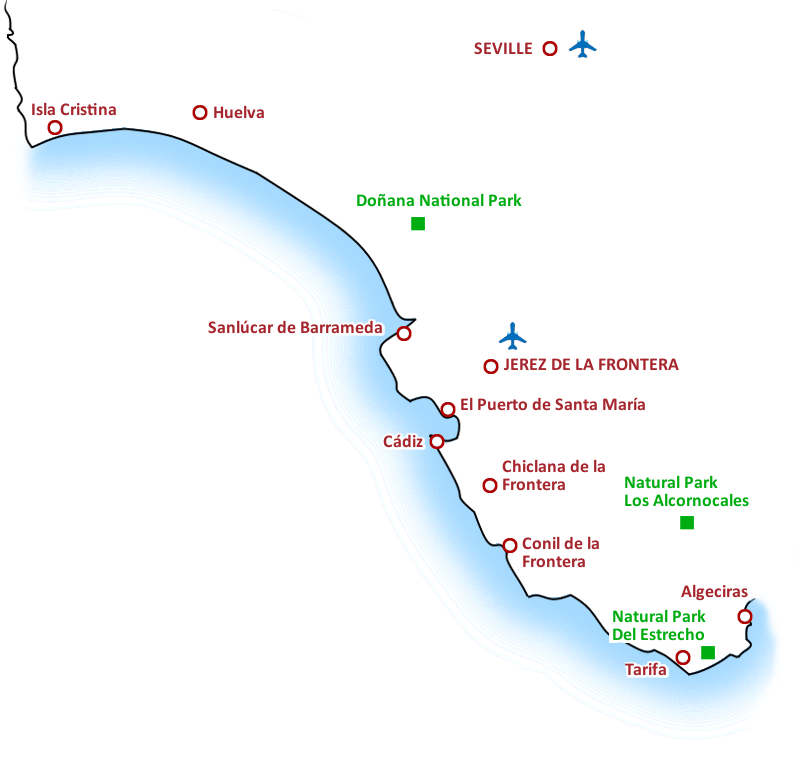 Tours and activities in Costa de la Luz: get everything ready way ahead of time! Send unwanted surprises packing and get the very best out of your trip to Costa de la Luz. Say no to the disappointment of sold-out shows and jam-packed tours and activities and, on top of that, save some pennies as sunbonoo gives you the best out there for your hard-earned cash. Delight in the first-rate customer service as the team are on hand to deal with your questions and so on at any given time. Get everything sorted in advance and put a stop to the drama of showing up and having nothing to do on your holiday. Sunbonoo tickets double up as an excellent alternative to the run of the mill birthday gifts as well so keep us in mind for those special occasions when they come up! If you're on the lookout for something on land as you're going to do a cruise, then look no more because we guarantee to give you the best rates on the market on that side of things! What springs to mind when someone mentions "Coast of the Light"? Golden sands, see-through sea and verdurous landscapes! Costa de la Luz is exactly what it says on the tin with no nasty surprises! Take a trip down to South West Andalusia and get your kicks in this special and authentically Spanish region! The coastline spans 380km along and goes all the way to Portugal. As you can imagine, there's a lot to see and do in Costa de la Luz. This place is to Europeans what Hawaii is to Americans, simply put: paradise! Where did the name come from in the first place? Well, it doesn’t take a genius to work that one out! The sun beams across the sands and practically enchants you with its beauty! Get right into the thick of it by hiring a Jet Ski or a kayak as you simply cannot miss a beat when you're knee-deep in the sea (if you fall off/out). Bid farewell to the struggles of everyday life back at home as you blissfully cruise along the Ocean on a boat trip in Costa de la Luz. Breathe in the salty air and look out across Northern Africa as you drift off in your daydreams. If you need a change of scenery, take a trip into the wilderness as you cruise off into the countryside. Do it big in the city or cities as it happens in Cadiz or Jerez de la Frontera and wind your way around the inviting alleys and such on a Segway. When all is said and done, it only had to be a matter of time before you tucked into the delicious delicacies and set out on a typical Tapas Tour – this is a must-do in Andalusia as they are famed for their love of Tapas more than any other county in Spain! An Andalusian holiday wouldn't be complete without a fantastic Flamenco Show. The passion beams from the dancers and casts a spell over the audience at the same time. Get a piece of the action and hop on a jeep safari through the best of the bunch in Costa de la Luz. Get a real bite into the untouched and impressive natural side of the region as you visit the Doñana Nature Reserve. Ride as the sun fades into the background on a horseback trip that you'll never forget at the beach or let the kids lets off some steam as they visit some of theme parks. Let your imagination run wild as you explore a region that has so much more to offer than beautiful beaches and wonderful weather. Huelva is teeming with history and is well worth a trip to. It'd be rude not to make it to the capital of Andalusia: Seville! With many monuments to pick from, you won’t run out of things to see in the pretty city! The sunbonoo team can't wait to give you a helping hand in making your holiday the best you've ever had!